For control applications, the amount of time that the loop cycle time varies from the desired time is called jitter. 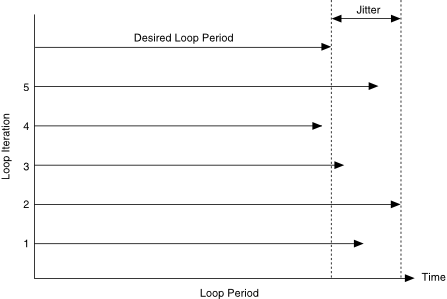 The maximum amount that a loop cycle time varies from the desired loop cycle time is called maximum jitter. In real-time systems, jitter is bounded. For instance, air bags must deploy within fractions of a second after a critical impact and are thus bound to a maximum jitter. In non-real-time systems, jitter is unbounded—or very large. Waiting for a bus is an example. Suppose that according to the schedule, the bus is supposed to arrive at 11:00 a.m. but actually arrives at 11:05 a.m. one day, 11:30 a.m. the next day, and has a flat tire the day after that. There is no bound on how late the bus could arrive.